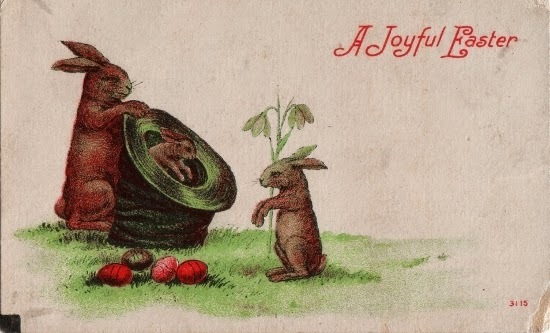 I have more postcards featuring Easter animals but this time they are more like little humans in animal clothing, the proper term is anthropomorphic. 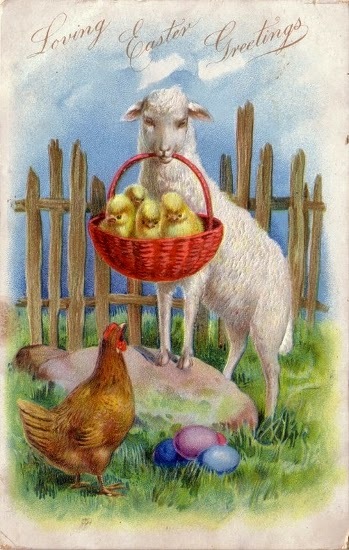 In this Raphael Tuck and Sons postcard a ewe is proudly showing off some very large chicks while the hen, with coloured eggs at her feet, looks on. I love that fence in the background. 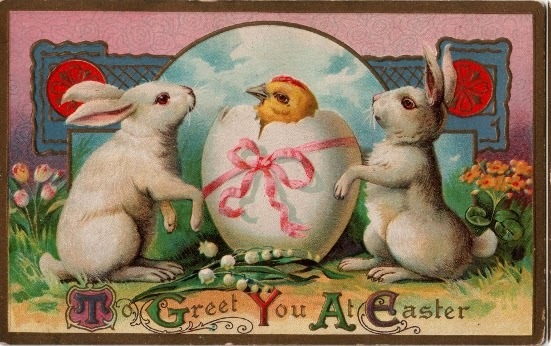 While I was writing this I remembered a friend who had some antique Easter decorations that are the most disgusting I have ever heard of, three dead chicks. Evidently this was common!? I suppose they were just dehydrated. The chicks could be tucked in an Easter basket, "Oh Mummy aren't they cute?" 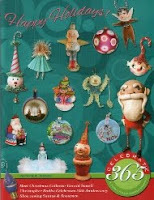 or on a Christmas tree, "Look Ethyl, little chicks, so charming." I never did see them, I had no desire at all. Well now that I have grossed you out completely lets get on with more pleasant things. The Cadbury Easter Bunny is only doing what comes naturally to all Easter Rabbits, flying an airplane. This postcard is from 1911. Miss Ruth Pugh received this postcard from her cousin Inize Berry? on April 9, 1909. She writes, "Ruth what do you think of these big Easter eggs (Easter Eggs is underlined) I go to school everyday and like it some Pretty bad days too (too is underlined) come and visit me sometime your loving cousin" She may not have used any punctuation in her pencil written message but she did like too underline words. 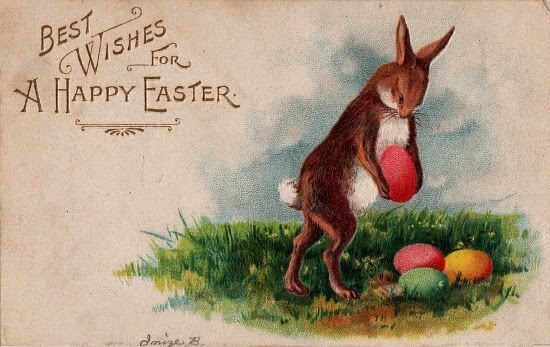 I like the richness of the colours and the formality in this postcard. 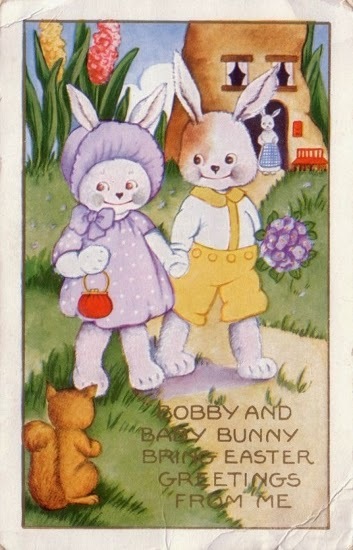 What a delightful rabbit couple out for a stroll. 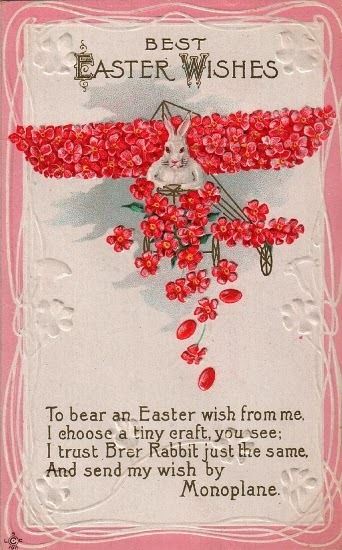 This card may be part of a series, I'm not certain, but it is the second part of a letter written home. It was probably in a package that was sent home because there is no post mark. The back of the card is written on, entirely ignoring the area for the address. 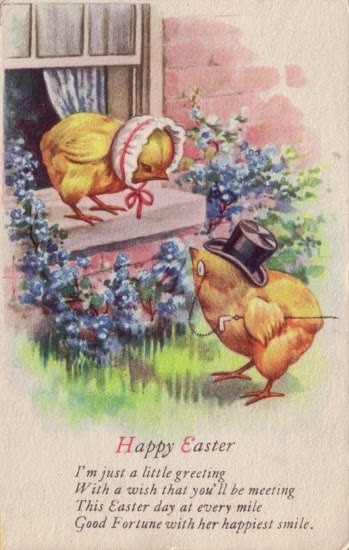 The back reads - (there is an underlined 2 at the top of the card) "this Easter in Blighty now but of course one never knows and I may be home sooner than I think. I guess you have Frank at home now and having a rare time plenty of fun etc. eh, I only wish I was at home with you all for here I" and that is the end of the message that would have been continued on the next card or cards. Who knows what was said, thought, or happened in this anonymous person's life. I wish I had the rest of the cards. Two chicks in their Easter finest are ready for the Easter parade. Chicks are baby hens and roosters but these little guys appear fully grown and perpetually in a state of grown-up childhood. 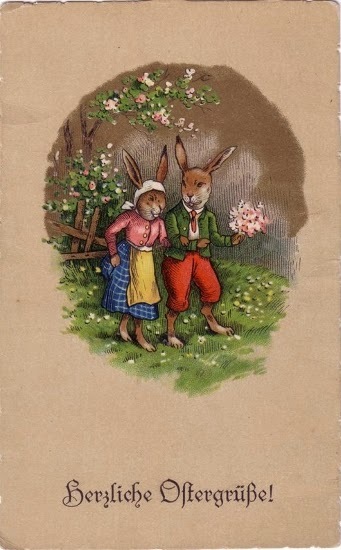 This a 1920s or 1930s children's postcard. It is cute but the quality of the drawing is not the same as the earlier cards. Tennis anyone? That is one tough egg that is being batted back and forth over the tennis net. I just noticed that each rabbit is hitting an egg to the other rabbit! That is one difficult game! 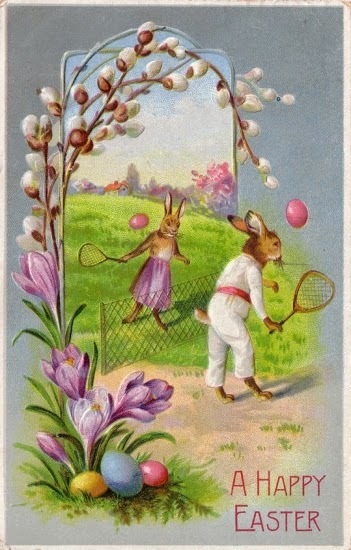 I like this delightful card it has coloured eggs, Spring flowers, a meadow with blue skies, a home in the distance and you can smell the sweet Spring air and feel the warm breezes blowing on your face. This last card is cruder in the drawing and the printing than the previous cards which makes all the more charming. I wonder how many rabbits, eggs, and flowers will come out of the magicians top hat?